A wig can instantly change one's appearance and offers a great deal of flexibility when it comes to hairstyle, color, and length.Many women who care their beauty live without real human wigs today.Maybe you decided on long silky black hair that shines in sunlight, or instead picked spunky short hair with a bit of a curl. Perhaps you chose wavy blond locks that you can braid or went for the long bangs to contour your face. Do you know the proper way to put on a wig? Whether you have long hair or short hair, we'll show you some tips and tricks to keep your wig securely in place. 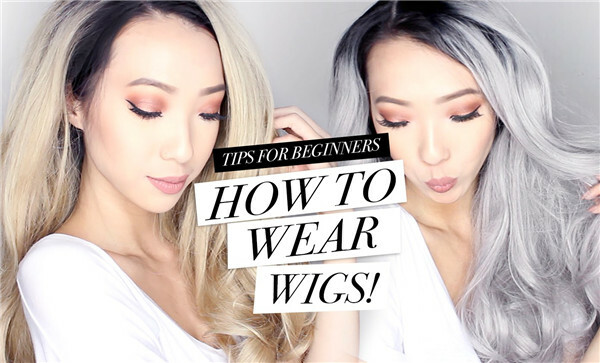 If you are new to wigs, this breezy tutorial will be a big help! 2.How to put on a wig step by step? 3.Video of how to wear a wig. 4.How to make your wig look natural? How to put on a wig step by step? Trim the lace on the full lace wig. This only needs to be done the first time you use your wig, and it does not need to be done if the lace has already been trimmed by the manufacturer. To trim the lace, put the wig on your head. Use hair clips to fasten the wig hair back away from your scalp line. This tutorial is a step by step video on how to wear a wig and make it look as natural as possible. Hopefull it is helpful. Enjoy! How to make wig look natural? Many people wearing wigs for the first time worry that their wig will look unnatural and that others will know they are wearing a wig. However, this is not the case if you are buying a high quality wig, have the proper fit and take the time to care for your wig properly. Here are some tips for making your wig look natural. When a wig is ill-fitting, it can move around on the head or pop up in the back. This will not only be uncomfortable, but it will not look natural. So you should measure your head,then choose a wig that suit for you. Just like with your natural hair, you can have a professional stylist trim your wig to create a look that best compliments your face shape. This will make the style appear more natural. For the best results, have your stylist trim the wig while you are wearing it. Ensuring that your wig is properly cared for will help to extend the life of your wig and keep it looking natural and healthy looking for as long as possible. A wig that is not properly cared for can become frayed, frizzy and damaged, leading to an unnatural appearance. Only use shampoo, conditioner and styling products made specifically for synthetic wigs, and only use combs and brushes created for wigs. Video of how to make your wigs look natural. Hey beauties, Here is a tutorial showing you guys how to make my lace front wig step by step and how I make natural hairline easily! There is nothing like being able to wear a wig confidently and know that everyone thinks you just have a great new hair style. It can be done. We have worked with customers who have fooled even their spouses just by using a few of the trick and tips provided above for a wig that looks like your own natural hair. For more information about where to buy natural looking or custom designed hair and wigs, feel free to visit the following our company or directly buy from our store UNice wigs choose from a great variety of wig styles in various colors and lengths.